one of which was Over the Waves and I soon learned to waltz. Please push the audio to join us in a waltz. As I tug my bags out of the car and get them up on my shoulders, to walk in the house, I remember Momma each time I visited her. Regardless, whether I arrived for a stay, returned from a trip or was going to take her to the grocery store her greeting was always the same. She may have come to the car in the summer, waited by an open door, or stayed in the kitchen, she greeted me with arms outstretched, my name a repeated a couple of times as I came close and as we hugged Momma planted little kisses on my neck. If she had been just a tad taller the kiss would have been on my cheek. Her kitchen always smelled of something being made, whether she had just baked cinnamon rolls or the dinner was emanating aromas of tasty food in the oven. Momma loved to cook and she passed that love on to me. Often she said that she couldn’t cook as good as me. Always I clarified the issue. I was trained in cooking and she wasn’t. I knew the buzz words of food and she didn’t. I may know how to set a table for a ten course meal perfectly, but does that really matter when you are sitting at a table, eating something someone has prepared because they love you? Not only only was my Mother’s cooking very good, her canning was superb. The cellar shelves were filled with colorful rows of vegetables and fruits from their garden. When my sister and I went to Iowa for visits going to the basement was like going to the grocery store. Early on I asked my Mother to write down how she made the items I loved: Tomato Juice, Tomato Sauce, Cooked Tomatoes, Hot Peppers, Jams and Jellies and more. During the time last three years I had lots of vegetables and fruits. The first year didn’t bear much of anything to can. The second year I had fruits and vegetables to can. Momma sat in her wheel chair by the stove and walked me through each one of the recipes. Then when it was ready, she sat at a small table and helped put whatever I made in the canning jars. That whole time she had a smile on her face!! Little did we know that in a couple weeks Momma would be in the hospital, the stay that began her final, year long fight to live. This year Momma was unable to help. Late evenings became the time that I prepped the tomatoes, apples, etc. and then canned. In between the steps I sat to Momma to sit with her a while and thanked her for showing me last year hoqw to can. A, small rare smile would appear on her face. When I was young, Momma’s closets were like any others except every outfit was perfectly hung and pressed. Much later in her life, particularly when we were in Arizona, my Mother’s love of clothes became paramount. When we first moved Momma rented an apartment that had a walk-in closet. Compared to her closets in Iowa this looked big. In just a year the closet was a little tight. After that, for the next three years Momma brought seasonal clothes to her big walk-in closet in my house. By the end of the fifth year she was getting restless and wanted a bigger apartment. We found one with lots of closets, a bigger kitchen, a small room for an overnight guest, etc. She was so happy. The day I moved her in we both laughed when I put her clothes in the different closets. They were almost filled to the brim!! I told her not to worry, she still had the closet at my house. Momma was one of those people who was always thin, had a great shape and kept it that way. After my Father died I told her she didn’t have to watch her figure so closely and so she lightened up just a little, but it was still important to her to not ever be more than a size 6. After Momma had her stroke I made all her clothes for her. It all started as a very basic design and in due time Momma had found fabrics and suggested little tweeks to the design. Next came finer fabrics and clothes for all occasions. We shopped a lot at Joann’s, which is very close to us, for crafts and to look a fabric. As her 86th birthday approached I suggested we look at the fabrics for a dress. As I pushed her in her wheelchair down the racks of fabrics, suddenly the hand went up and I knew she had found something. Before her was a new collection of denim fabrics, some embroidered and some plain. That birthday Momma wore her new denim dress embroidered in lavender and purple stars designed traditionally with jean buttons, shirt-style front and buttoned cuffs. and she enjoyed wearing each one. I always enjoyed making something new and surprising her. Momma passed on so much to me during the last fifteen years that we were together, whether in Arizona or Illinois. 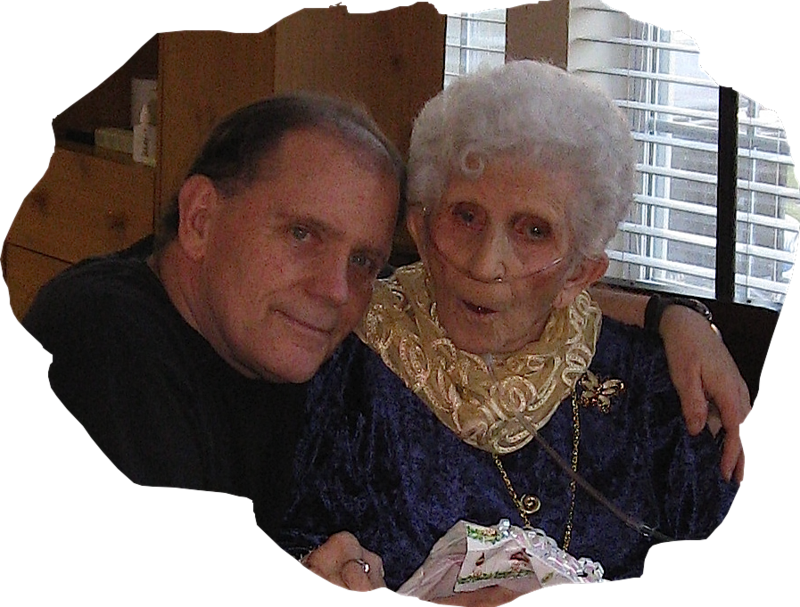 I am sure that if I had taken the time previously, before my Father died, that Momma would have shared herself with me, but I was always on the run working. Her greatess gift to me is her love. Secondly she passed on to me her curiosity, although it was not until after her death that I started to understand why Momma looked forward to tomorrow. It was the unknown and she loved thinking about what may happen. I think I had already inherited her ability to share. If I had not then I doubt there would be two blogs I write on, one writer’s site and one cyber community that I am the Manager of a writing group. Unlike her, I do not have the ability to play with words. M, admired my Mother for this. He would give her a phrase and she would quickly turn the word and phrase back with a new meaning to him. My sister has that ability, as well as the ability to hear words and rhyme them, as my Mother was able to do. She has always been my anchor in Life and the one person that was always consistent with me. Her love never lessened, it only grew stronger. If she became annoyed with me it was temporary because her love was deeper. She became my Sunshine and now I have her safe within my heart and she will continue to provide me with sunshine all the rest of my days. Posted on December 4, 2008 September 5, 2010 by suntithenaiPosted in Rememberance, True StoryTagged memories, Momma. Previous Previous post: Imagine its absence while you are alone! I love reading your stories about your momma! I cannot imagine having so many clothes that they overflowed into all the closets in my house! hahaha! I used to enjoy canning, but I don’t have a garden here in Phoenix. That was back when I lived on the ranch and had a big garden. 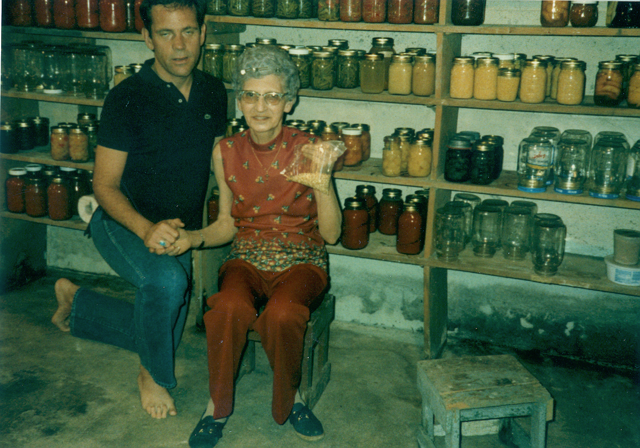 My good friend Barb’s mom used to make homemade sauerkraut. Oh MY was it ever good!! Frank, Such an amazing relationship you and your Momma had. And you made her clothes? How absolutely fabulous!!!! No wonder she gave you all those kisses!!! (Just Kidding). You are a very talented man, and I can see, that all aspects of the arts are what gets your blood going! Canning, Sewing, Writing, Artwork, and more that you will tell us about, I am sure. Your life with your Momma reads like a storybook, and I am both delighted and saddened. Saddened because I never knew anything like this. Such a close relationship, and yes, her greatest gift was her love. Now grab hold of that curiosity about tomorrow that she also passed on to you. Life is a great mystery, (and adventure) and I believe that there are wonderful things ahead…just around the bend. As I read you astute comments to me I suddenly felt very sad that you do not have a Mother like mine was. When she was a child her Mother treated her very badly. She made up her mind that she would never be like her Mother. She wasn’t in the least. You are much like her in that you did not become a carbon copy of you Mother, but rather one with care, feelings, understanding and lots of love for your daughter. I think it is significant that you and my Mother rose above your childhood and did not allow the treatment you received to effect how you treated your husband and children. Now, that shows your strength and for you your strong faith in God—Still, Sparkle take it easy and keep your eyes open for a while!! Oh, I forgot to say that I very much enjoyed the waltz, and the picture in my mind of you and your Momma dancing. It could be a movie!